Minerals containing aluminum are natural and abundant in the soil. Acidic soils increase ‘free aluminum’ levels, which bind soluble (plant-available) phosphate, can cause plant toxicity, and ultimately can significantly reduce crop yield and quality. Lime does not instantaneously correct soil pH and aluminum-related problems. While visible improvements can be observed even in the same season, it can take years for lime to fully mitigate soil acidity and reduce levels of free aluminum. Soil testing every three years and following soil test recommendations will reduce the likelihood of developing aluminum-involved crop production problems. there are many tremendously important things in it that are invisible or barely visible to the unaided eye. This is true for much of the soil ecosystem: bacteria, viruses, massive webs of microscopic fungi, frightful soil insects, hideous mites, sprawling plant roots, decaying plant material, all sorts of [naturally occurring] chemicals. Soil organism populations oscillate wildly, depending on environmental conditions, complex chemical reactions are occurring everywhere – it’s a war where chemical and biological weapons are the norm, and yet somehow there is order, beauty, and a little predictability to it! And yet, most of it is invisible. uptake. As much fuss as we make about phosphorus management, in Vermont, MANY acres of Vermont crop land are severely deficient in phosphorus. To a great extent, this problem is induced by soil acidity. The free aluminum released as the result of soil acidity gladly and strongly binds soluble phosphate, making it unavailable for crop uptake. meq/100g. Clay and soil organic matter increase CEC, and are essentially the shelves in the pantry. Under acidic conditions, free aluminum resolutely occupies more of the CEC positions and displaces a variable proportion of those other nutrients that would otherwise be in those positions. Inhibition of lateral root formation. Reduced root diameter, and increased root brittleness. Damaged structure and disrupted function of cell membranes. More random root branching patterns. Disrupted signaling/communication pathways within and among plant cells. Interference with the uptake and metabolism of essential nutrients (at the molecular level, not just due to poor root development). Increased susceptibility to secondary (opportunistic) diseases. Not surprisingly, reduced water and nutrient uptake, and ultimately reduced crop yield. My soil pH is 5.6, which is high enough that free aluminum toxicity should not be a problem! There are two things to keep in mind before concluding that your moderate acidity is not an agronomic and economic problem on your farm. First, under such conditions, phosphorus availability is being negatively impacted by free aluminum. While high phosphorus levels are a problem in some fields in Vermont, many of the soil test reports I see from Eastern Vermont are on the low side. Some are extremely low. Because there is a very strong relationship between available soil phosphate and crop yield, farmers should be alarmed when their soil test reports indicate that extractable phosphate is below the optimal level. Secondly, if the AVERAGE soil pH is 5.6, you probably have many zones (large and small) where the pH is much lower and where aluminum-related agronomic problems are more obvious. Some of those zones will have toxic effects on the roots – rendering the nutrients and water in those zones less available for uptake by the affected plant. The picture to the right shows a field that was, on average above 6.2, but the corner pictured ranged from pH 4.0 (the wheat that is almost dead) to 4.4 (the healthier looking wheat). Soil sampling can feel like a lowly task, especially when you have other urgent things to do, but your crop yields and forage quality depend on you having good information. Getting good information depends on a careful sampling process that acknowledges the fact that you are trying to get a 1 cup soil sample to accurately represent up to 40 million pounds of soil (the approximate weight of the top 6.7 inches of soil in a 20 acre field). Farmers should own the basic tools of the trade: get a good soil probe or auger. Other tools include plastic buckets, zip lock bags, a thin spatula, and something to break soil cores apart in the bucket. Yes, you now have another excuse to buy an ATV. break the field up into more than one zone. In some cases, it is appropriate to combine small contiguous (or extremely close) fields into one sampling zone if soil type, slopes, management history are basically the same. In this case, total size of the zone should still not exceed 20 acres. 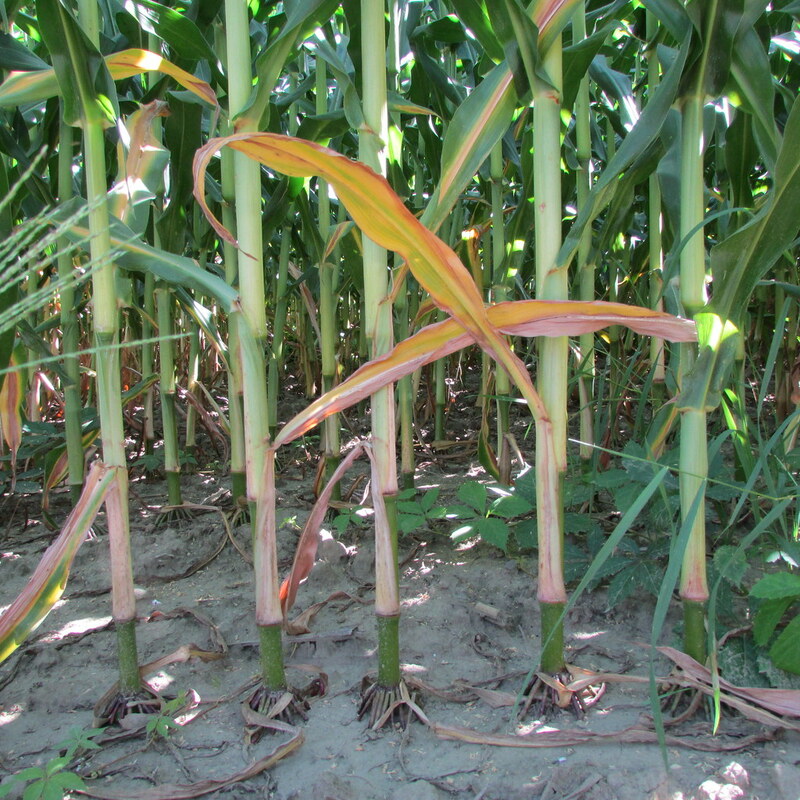 Do not take samples from places within a management zone that do not conform to the zone overall. If most of the field has good surface drainage, do not take cores from the tiny wet area (etc.). If the odd section of the zone is big enough to justify it, you can take a separate sample for that area. Otherwise just avoid it. Establish a system for keeping track of which samples came from which zone/field. Using a zig-zag or grid pattern, collect 15-20 soil cores from within each sampling zone. 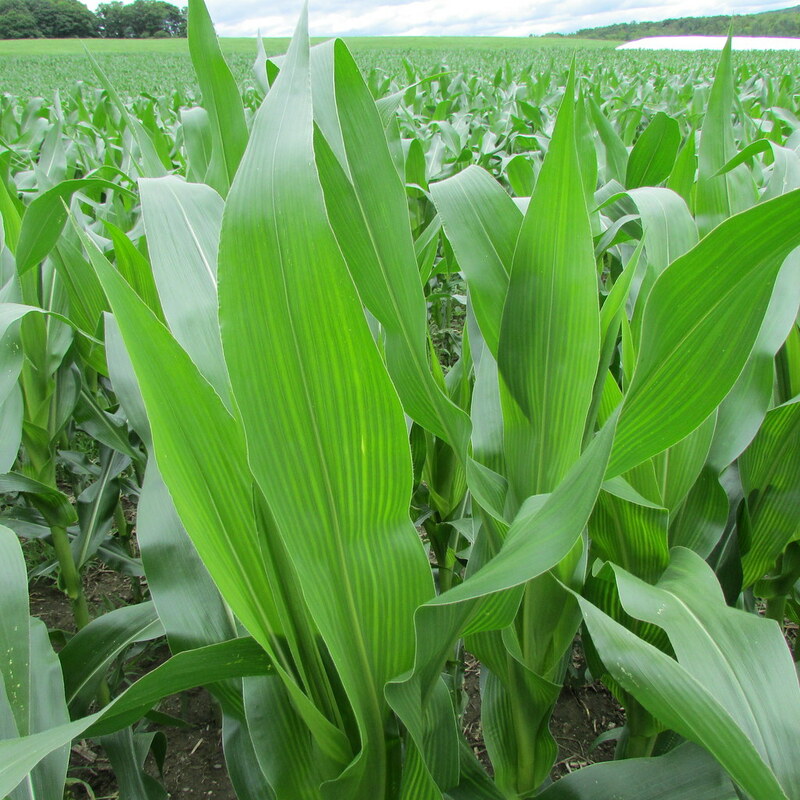 For standard soil testing of corn and forage fields, cores should be taken from the top 6 to 8 inches of the soil. Place the cores in the plastic bucket as they are collected. If you are sampling a corn field where fertilizer was band-applied and/or fields where manure was injected, follow the guidance given here. If there is a lot of living or dead plant material on the surface, gently scuff it aside with your boot or the tip of the probe, taking care not to displace actual soil. If green grass, rock, or thatch is obvious in the sample, remove it prior to sub-sampling. Don’t obsess about pebbles. It is probably better to rely on the soil laboratory to screen out plant roots in the early stages of sample preparation. should be broken up (using a trowel, spatula, etc). Mix as completely as possible. Wet soils or soils with layers of clay will often be more challenging and may need to be air dried and crushed before thorough mixing is possible. To air dry samples, spread them out in a thin layer in trays lined with paper. Applying a fan will hasten the process, but do not apply heat. Obtain a representative sub-sample from the sample collected. Depending on the diameter of your soil probe and the depth of your sample, you could have between 2 and 4 cups of soil from a management zone from which you need to take a 1 cup sub-sample to submit to the lab. Develop a procedure to get a truly representative sub-sample from the entire sample from that zone. Dump the thoroughly mixed/crushed soil in a pile on a flat, clean, and washable (or disposable) surface. Divide the pile of soil into 4 – 8 pie-shaped wedges. Take two opposite wedges – entirely, and put them in the appropriate labeled bag. A thin, unslotted kitchen-type spatula is a good tool for dividing and collecting the wedges. Attempting to use just your hands can result in a skewed result as finer soil particles will stay on the surface or fall between your fingers. If you need a little more soil to attain the volume you need to send to the lab, take some soil from the other wedges using a similar approach. Put the sub-sample in the appropriately labeled plastic bag. Send the bagged samples/sub-samples to the soil analysis laboratory as quickly as possible. For a complete list of certified soil labs, click here. If there is going to be ANY delay in sending it to the lab, refrigerate (but do not freeze) the sample. Soil is ‘alive’ and chemically reacting, so the longer you delay submitting your soil sample, the lower your data quality from the sample will be. Air-drying the soil samples is an extra step, but it is an even better alternative to refrigeration if your goal is to slow the deterioration of soil sample quality. Air drying should be done at room-temperature (no heat). Spreading the samples out on clean paper and applying a fan will hasten the drying process. In this case, ‘air drying’ means that it needs to get ‘dry-as-dust,’ with no sign of moisture. Ideal soil status for your crop with respect to: pH, phosphate, potash, magnesium, sulfur, boron, and other micro-nutrients. Nutrient removal rates and management guidelines for various crop. Nutrient sources and management guidelines for those practices. Other crop-specific information for geographic area. Local Extension agronomists and certified crop advisors are equipped and ready to help you interpret your soil test report and to make practical recommendations. The vast majority of professional dairy farmers in Vermont are now legally required to soil test every three years. This applies to “certified small farm operations,” MFOs, LFOs, and maybe even UFOs. The farms mentioned above are also legally required to test each the manure from each storage source at least once every year. It is better to take spring and fall samples from each storage source if you are able. Both of these arise from the VT-RAP requirement (6.03.a) that these types of farms follow the Vermont-specific USDA-590 standard on nutrient management planning. These farms will be periodically be inspected by the state, so it is not just and “accepted practice,” it is required and will be enforced. Part of executing your required nutrient management plan is record-keeping. Among other things, be sure to keep good records of how much manure went in which field, at what rate, when it went on, what the conditions were, etc (this is not a comprehensive list of the records you are required to keep). These very practical (and legal) realities about soil and manure testing that arise from the Vermont Required Agriculture Practices (RAPs) issued from the legislature last year, and are part of the overall requirement to have a nutrient management plan. The five bullet-points above are not an exhaustive representation of the law, so be sure to familiarize yourself with it by clicking on the link. If you are having trouble discerning how this law this applies to you, please contact me, another UVM Extension agronomist., or better yet, Ryan Patch (VT Agency of Agriculture). Please understand that we (UVM) are just messengers – we did not write the law. That being the case, we are glad to help you understand and comply with it. Dairy producers are seldom ambivalent about reed canary grass as a forage species on their farm — they either love it or hate it. Those who hate it generally have had difficulty getting it harvested at an acceptable level of maturity, and the fiber levels end up being higher than they prefer. Others like to grow it because of its productivity, persistence, winter-hardiness, and its ability to thrive in a range of soil types and conditions. ‘Feral’ varieties of reed canary grass (such as are common in roadside ditches) are high in bitter-tasting compounds called alkaloids, which can reduce dry matter intake and reduce performance in grazing species. Plant breeders have been successful in breeding low-alkaloid varieties of reed canary grass (such as Palaton, Marathon, Chiefton, and probably others – no endorsement implied) that are palatable enough to even be used in dairy grazing systems. A few years ago I asked a local farmer if he had ever planted reed canary grass. He said, “Yes – I – did! The seed was wicked expensive, and I never saw so much as a stalk of it come up!” This points to one of the challenges with reed canary grass: low seedling vigor, and low yields in the first year. To be fair, reed canary grass seedlings are different – not deficient. In order for reed canary grass to gain a foothold, very few seedlings need to survive. It ‘knows’ that it has rhizomes and that they are a tremendous strategic asset, so it focuses on underground development more than top-growth in years 1 and 2. Good for the plant, bad for the feed inventory! If a farmer is not careful with seed placement and/or attentive to managing competition appropriately in year-1, it is certainly possible that the stand will be a failure. But what if the farmer cannot afford to accept the low first-year yields? Will companion crops such as spring triticale, oats/peas, clover, or Italian ryegrass help significantly? Yes, they can, but there is a balance that could be hard for some to find. We want decent yield in the seeding year, but we also don’t want to out-compete the perennial species (reed canary grass, in this case) to the extent that we damage second year yields or lose the stand altogether. That is the subject of the short video below. Footage was collected in Spring of 2016. Is This Corn Really Sulfur Deficient? A farmer called several weeks ago and said that his corn was looking ‘striped.’ The agronomic jargon for this condition is ‘interveinal chlorosis.’ Indeed, it was faintly, yet distinctly exhibiting those symptoms. Yellowing and tissue death on leaf margins, beginning with lower leaves? Potassium deficiency! Generally yellow and spindly plants; yellowing of leaves starting at the bottom and moving upward with time; yellowing begins along midrib and moves outward toward the margins; lower leaves and previously yellow tissue often in various stages of death: nitrogen deficiency! Ordinarily, I would expect a sulfur deficiency to be on sandy soil and to be patchy/localized. Because manure application is never perfect, the corn in areas where manure was applied more heavily are much less likely to have the symptoms. 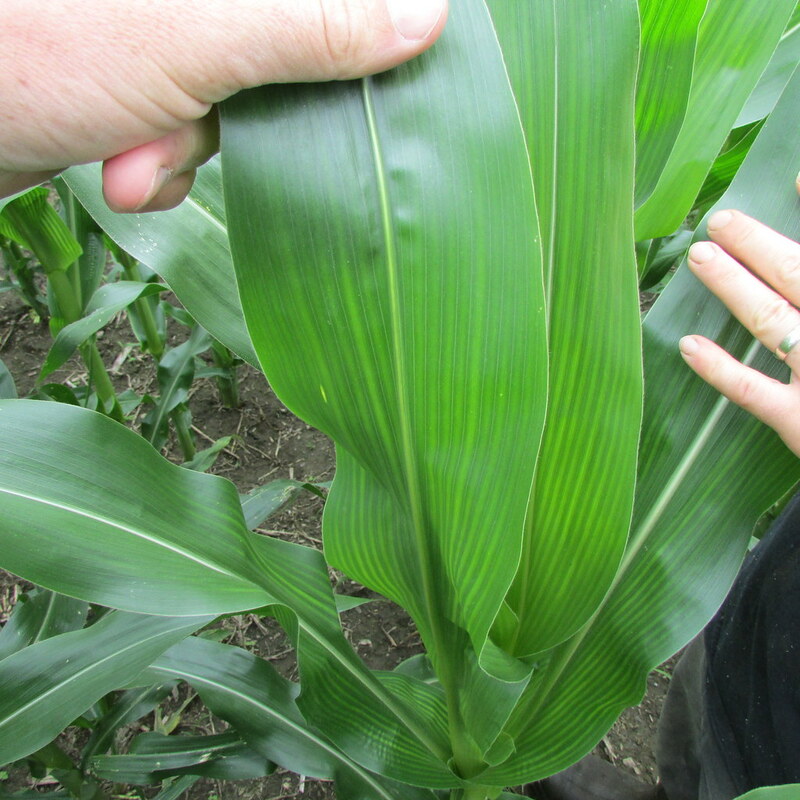 However, nobody had seen/noticed a sulfur deficiency on this field before, it receives manure (a good source of sulfur) and the soils were warm (which often increases sulfur availability and results in sulfur deficiency symptoms disappearing). Together these things were pointing to hybrid (genetics) interacting with environmental effects without a clear connection to a particular nutrient deficiency. 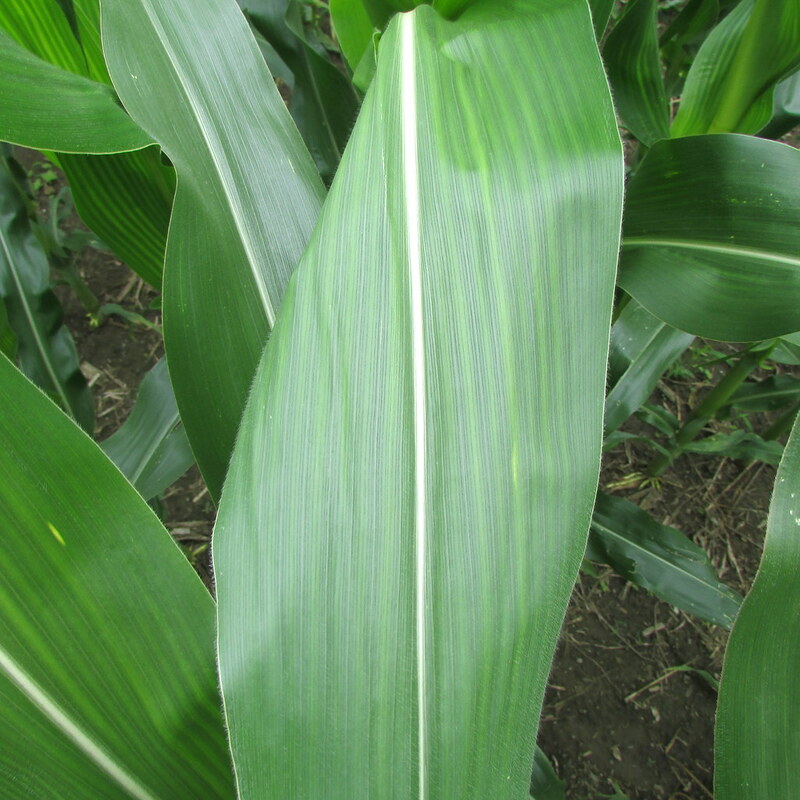 When in doubt, taking a tissue test can reveal the nutrient deficiency that is responsible for the deficiency. Ideally, a separate composite sample will also be collected from asymptomatic plants in the same field and of the same variety, but in this case there were no asymptomatic plants. Given the stage of maturity, rather than collecting whole plants or ear leaves, we collected 20 youngest fully developed leaves from around the field. The leaves were submitted to Cumberland Valley Analytical Laboratory via the feed company. The analysis showed that while boron, manganese, and magnesium were on the lower range of the sufficiency range, the symptoms were not consistent with deficiencies of any of those nutrients. Sulfur (the primary suspect) concentration was toward the middle of the sufficiency range, and the N:S was about 14:1, which is not problematic. One caveat I will add is that there is an interesting theory floating around that with the yield potential of modern corn hybrids, the ‘sufficiency range’ should be indexed to yield potential, i.e., the sufficiency range for corn grown in a context where it is headed for 17 tons/acre will be different from corn at the same developmental stage that is headed for 30 tons/acre. That said, published sufficiency ranges might not be nuanced enough and may need refining. The aforementioned farmer had the same hybrid planted in another field located 30 minutes from the home farm, and the plants in that field exhibited the same symptoms. At this point everything is pointing toward variety X environmental effects. Since then, I have seen a couple of other farms with similar symptoms in their fields. Internet searches will reveal various articles discussing plants with symptoms discussed above. Richard Taylor (University of Delaware) has observed the phenomenon in Delaware and Greg Binford (Wilbur-Ellis, formerly at University of Delaware) apparently have observed similar things in the Midwest. While they lean toward a sulfur-involved hypothesis, they believe that there is a varietal aspect, yet acknowledging that grain yields from fields with ‘symptoms’ can still exceed 300 bushels/acre (which is phenomenal). At the same time, intuitively, yellow stripes suggest less chlorophyll, which makes one wonder about less photosynthesis and compromised yield. What to do?? Take a look at your fields and let me know if you see these symptoms in any of your fields. If you do, please let me know which varieties are exhibiting the symptoms. Maybe we can find a pattern and better understand what is going on, whether it is a concern, and how to deal with it. Contact: daniel.hudson@uvm.edu mobile: 802-535-7922.